Art 'Playing in Leaves' from Exhibit Entries by artist Amy J. These stunning borosilicate glass beads by Rodney Andrew of Buford, Georgia bring to mind the days of my childhood when my Daddy used to rake the leaves into huge piles in the yard and I used to dive into them, spreading them everywhere, making him rake them up all over again - it was a game we played endlessly until we moved to a house that didn't have enough trees to produce enough leaves to make enough piles to dive into. Now as an adult I live where there are lots of trees and lots of leaves and lots of piles for my own children to dive into! 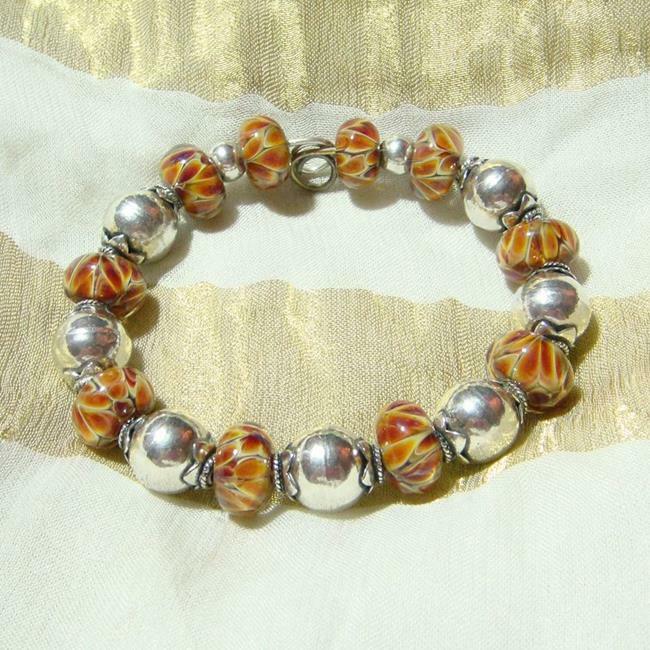 The boro beads are spaced with HUGE Bali sterling silver beads and the colors in the beads are just spectacular, with reds, oranges, umbers, yellows and browns, all in encased in clear glass. The leaves in my yard are just turning these colors right now!